Loose and free, so so many voice the desire to arrive at this painterly nirvana. This transcendental moment when we express our selves in paint as naturally as breathing. Intuitive, expressive, instinctive… these words are often dancing in close attendance when artists convene to share their hopes and ambitions. I hear this mantra again and again… and in weaker moments I have supinely agreed. It is after all received wisdom that nearly all would accept. Except I don’t. It speaks to the part of us that would like hard things to be easy or at least become easy. My experience is alas that it never becomes easy, or even easier. The dreadful thing is that to an external observer watching you do your thing it does look easy. Many artists make a good living churning out videos with tinkly music as they make paintings fly effortlessly off the brush and never ever go wrong. They never stamp on their daub and go off in a huff. They almost all, with a few honourable exceptions, recite the mantra of keeping it loose. They also raise the fear of the demon that hovers at the shoulder of many painters… the demon of overworking, the wicked being that lures you into making one stroke too many. If you make that evil stroke the painting will be ruined there is no going back. Always there is the nagging, don’t put in too much, less is more, let the brushstroke lie and don’t fiddle. For beginners I feel this is a little cruel and also I suspect not entirely honest. I would lay money that all these super free painters have dark secrets in the bottom drawers of their plan chests… those early drawings where every leaf is defined, every root lingered over. There is also the heretical suspicion that maybe they gained the ability to appear loose and free via an extended period of drawing kittens with every hair defined! Maybe there is even that secret pencil drawing of Elvis done from a photo using an 8H pencil with a scalpel point. Why is control and cool calculated precision so evil? If it is then we must avoid enjoying Breughel or Van Eyck. Escher is a no no. None of the beautiful books of hours are worth a candle. Chardin, Vermeer and so many others must be consigned to the dustbin. Degas because he fiddled for France, so much so that you can’t date many of his works as he fiddled with them over decades. He liked to comment that the just flown off the brush appearance is a lie and likened it to a crime done in secret. Which is interesting as it is about this moment that the myth of instinctual expressiveness was being developed. There was nothing Degas enjoyed more than tweaking the noses of other painters if they got too above themselves. Really the whole unify, simplify, keep it loose mantra only refers to impressionism which is only a very small style backwater. It is essentially the art of painting something that looks like you did it while squinting when you left your glasses at home. This allows the viewer to squint in turn and marvel at how clever they are to manage to see the donkeys and holidayers frolicking on the beach with only a few well chosen blobs of paint as clues. I am being deliberately provoking here obviously as it is the area of painting I am involved in myself. What I do want to get across though is that it is only one avenue out of many to explore. Not a gold standard that needs to be stuck to or indeed a formula for good painting. I have just trawled the internet for good how to do its. Most are unbelievably bad, but one thing that stands out amongst the ones I felt were good is that they were all very systematic. They always went from A through to J (X or Z would be over finishing obviously) there seems to be no getting it wrong knocking it all back and bringing it forward again. The watercolorists especially work from broad to key details and from light to dark. The oil painters patch areas together like a quilt over a mid tone block in. All in all not very free or exuberant even if the final result looks that way. This in turn makes me wonder about the anally retentive tinkly music… if you are free… really really free, surely you would be painting to the Pogues and pogoing while you splashed paint in the general direction of your canvas. I might float the idea with APV films. There we go that is most of the painters offended, now for some of my own crimes. I have a new development… I have always fancied having a painting wagon so I could overnight without getting cadmium red all over a hotel’s towels. So I could camp out near my scene and be up and at it before the sparrows had broken wind. So I finally bit the bullet and purchased a suitable vehicle with spartan but adequate internal arrangements to cook and sleep. This is my first outing… yes children it rained… oh God how it rained. In the middle of the night on the middle of Dartmoor I needed carry out a call of nature. The rain was horizontal so I decided that taking all my clothes off and just getting wet was the best option. Very bracing I have to say and now several sheep are in therapy. However as the rain was approaching I just about had time to paint this. 12in by 7in Oils. Next morning Dartmoor was entirely absent and the rain and wind were rocking my little home from home. Bodily needs were nagging me again too. I had passed through Moretonhampstead on the way and noted a public loo in the carpark… which pretty much decided my next painting venue. After eating a breakfast that knocked at least a year off my lifespan I parked my van inconveniently for all the locals and painted this from under the shelter of the back lifting door. 10in by 7in Oils. I decided to head for the coast but got distracted in Blytheswood by a let up in the rain… I got 30 min on this before the heavens opened again. 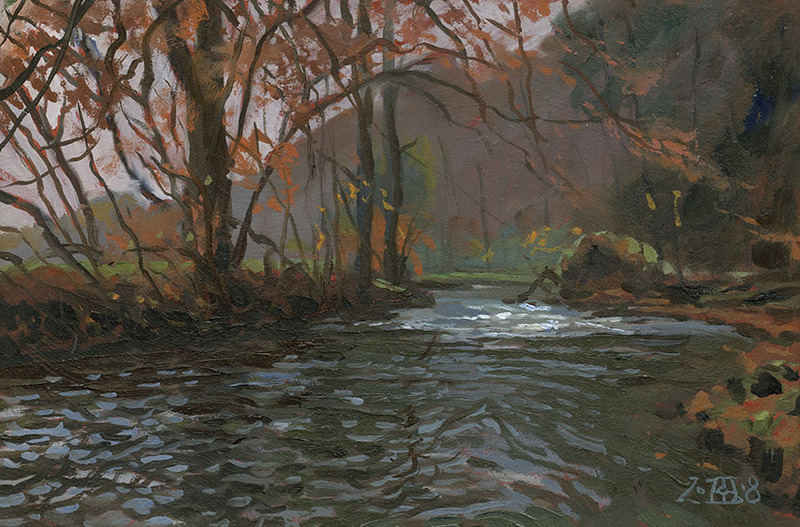 I must fiddle with the trees on the left but painting the water was great fun. 10in by 7in Oils. I was just getting near to Sidmouth when I found a cosy carpark with a great view. I have to glaze the right hand side to soften it but it was great fun perched on a narrow bank trying to get this wide view in. Then to bed in the van feeling a little more cheerful but still a little damp. 24in by 8in Oils. Next day it bucketed down so I just drove home. The day after I painted this from a phone snap taken through the rain smeared windscreen. It sort of summed up the whole expedition… one of the sheep winked at me as it went by. A few days later I went shopping in Lidls, they had fold up buckets for a fiver… I bought one. 24in by 8in Oils. 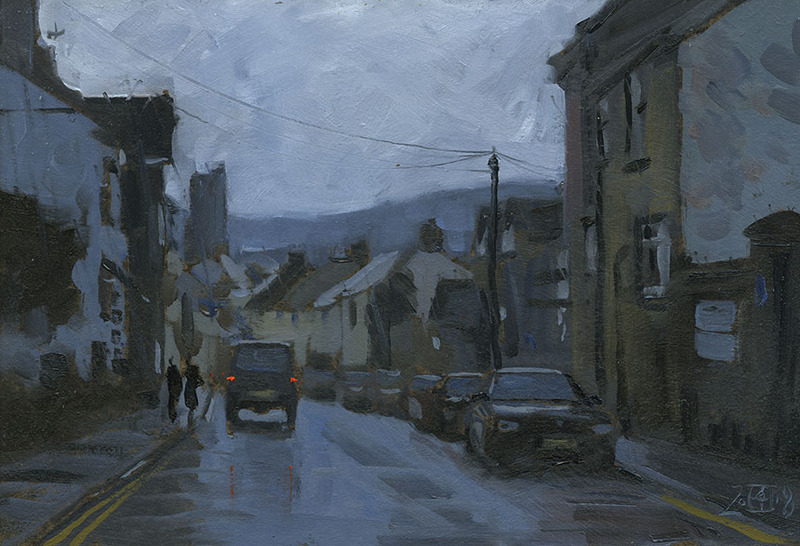 After the trauma of Devon I went out to Shaftesbury and on the way came across this scene which I had painted before in less than ideal light. We had to wait for the rain to stop but the wet road made a wonderful ribbon of light as it led away to Twyford. 24in by 8in Oils. I particularly love picture 2 and your excursion into dusk & vagrancy. As to being light, loose & free, I have never really solved the technical problem of how best to work on with an oil painting – which, I nevertheless do over many consecutive days, weeks or months on the same canvas. One technique I only know only by hearsay. My teacher of life painting at college, Jesse Cast, (a Tonks pupil) used to look at my painting and say ‘Have you a palette knife? Scrape it down old chap…” with no further explanation, and I took it very amiss at the time. But you don’t actually lose what you’ve done, which remains as a pleasantly Degas-like softness, and it’s the only way I know of starting each day with a workable surface. So, at the beginning of each day’s work (or before packing up at night) I scrape down the whole picture. This is the reason why I never do a ‘how to paint a crashing wave’ video to tinkly music – It might be a crashing bore, and I’m convinced anyone should be doing this at all. Yes, I do much the same on a studio painting that stretches over a few days, I regularly “Tonk” the surface with an old towel. The loose and free thing seems to have come with the necessity of doing a picture on site a la prima… you have to simplify and combine to get the damn thing done. This in turn gives the picture its immediacy and charm. I suppose what gets my goat is when other painters intimate to me that I should perhaps be little more free… as if in forty years of painting I might not have come across the possibility! Watercolorists are the worst they ask me if I ever do “wet into wet”. The answer is that I do but I never make it the point of the picture which for me would make the picture about technique rather than subject and my reaction to it. I feel that perhaps the idea of a considered painting has fallen out of vogue as being to cerebral and not instinctive enough. The best way maybe is to harness both to the same end, but it is hard thing to do. There is something to be said for pressure of time – and other painters around to interact or compete with. (I think Leonardo recommended this, and was quite open about being competitive!) Personally I love it when people look at my work at an early stage and I know they’re thinking ‘poor sod, he can’t do it…’ The hope is that later they’ll say (though it’s also quite annoying) No – you can’t possibly have done it! The standard of visual literacy nowadays is lamentable. This has been one of my favourites of your many missives. Reading with a good deal of envy what I am hoping will be only the beginings of your free-spirited mobile adventures. Your battling of the unforgiving elements in an endless and intrepid quest for new subjects and inspiration seems to me to be a great theme for some future writings from you, perhaps falling short of lashing oneself to a stormbattered ship’s mast. Seriously Rob I’m chuffed that you have bitten the bullet and done what you mentioned to me as a possibility a few years ago. Brilliant just brilliant. I’m glad to see that you are suffering for your art, in the time-honoured style. I do hope you haven’t caught pneumonia. 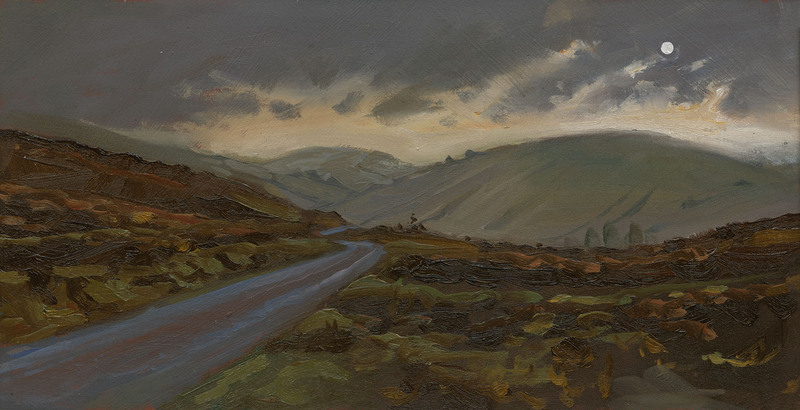 Still, the discomfort might have been worth it, because your painting of Dartmoor is terrific. I think the “loose and free” cliche may be perpetrated by teachers, particularly those attempting to teach beginners, who are often terrified, with little confidence, and are therefore very hesitant about making any meaningful marks. The instruction to use a larger surface or a bigger brush is much in the same vein, a means of trying to prevent inexperienced students producing tight, introverted, overworked paintings. I suspect this is such a common teaching technique that it has come to seem (by some) a key secret to producing great work. If I consider the artists whose work I find interesting, it would include, for example, Fred Cuming, Kurt Jackson, Andrew Wyeth, Joan Eardley, Gwen John, Chardin, Auerbach and the whole of the Camden Town Group. A fair mixture of loose and precise, large and small, fast and painstaking. I suppose what I am saying, and this is not to imply that one can’t learn from one’s heroes, is that by the time you have reached the stage where you know vaguely what you are doing, surely the only person with the authority to tell you that you are doing it wrong is yourself.